Now tell me who gets that giddy feeling whenever you hear that song. Ahh yes, Paris. The city of love, the coffee shop-filled streets and museums where maybe you’d have the slightest chance of meeting a fine young man with the same interests as yours. Paris does sound like a dream or an indie film. This city was not really one of my priorities or top places to go to before I die, but I was still very lucky to have visited Paris. It surprised me. Is it really how it’s portrayed in movies? How can you survive the city of wonder and art? What places can you go to? I will run you through how I managed to go around Paris. You can get to Paris two ways, either via plane or the Eurostar. Most people take the Eurostar coming from London and arrive at Gare du Nord station. Usually, people only do daytrips to Paris when they come from London. If you’ll be coming in by plane, Paris’ airport is Charles de Gaulle (CDG). Outside the airport and train station, you can find cabs and local metro trains and buses to reach your hotel or wherever you are planning to go. 2. Uber exists in Paris! If you’re familiar with Uber and how to use it, I am glad to tell you that Uber exists in Paris. I was the only one really happy about this because cmon, you all know how convenient Uber is. They only use the credit card option though. If you’re more than four people riding an Uber please choose the van. Quite surprised with their Uber that I actually felt like a VIP. The cars were very clean and looked business-class, the drivers were quite nice and they were all wearing suits. When you’re in Paris, people would recommend actually living the Parisian life. We chose to get an AirBnb during our stay. When choosing your AirBnb, make sure the flat you choose is accessible to a metro station or if possible, walking-distance to some of the places you’re visiting. Also very important note, if you’re traveling with an elderly or you are bringing along huge luggages with you, please choose a flat with an elevator or at least located in the second floor. Most of the apartments in Paris do not have an elevator. Luckily, we found one with an elevator. It would also help if you’re near restaurants or groceries. We managed to cook our own breakfast everyday because there’s a grocery nearby, that’s if your Airbnb has a kitchen. There are also cheap hotels in Paris, but we wanted to experience the real parisian way of living as to why we resorted to getting an Airbnb. The Paris Metro app is very useful, it can plan your routes for you because sometimes you have to take two trains to get to your destination. 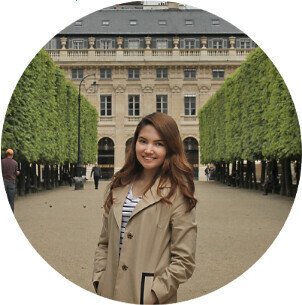 The Paris app by Triposo is another helpful app most especially if you’re there on a budget. It lists down hotels nearby you could stay at, restaurants and attractions. Just like London, the city of Paris also has different modes of transportation. The easiest and most convenient way to go around is by using the paris metro. Riding the metro is quite easy, but first let me teach you how to get tickets. There are two kinds of ticket machines now, there’s the old one with the rollers used for navigation and the other one is touch-screen. The touch screen machine is easier because some of the old ones are not in english. Simply point to get tickets and you can choose the option of getting a single ticket, a carnet or a day pass. I would personally recommend getting a carnet. A carnet is a set of 10 tickets. It was much more convenient for us buying a carnet. It will indicate on the screen the amount of money to be paid. Oh and some machines don’t accept bills and some do, so better check it first before buying tickets. These tickets can also be used in buses. Now, riding the metro. Simply insert your ticket on the gate to enter the metro. Please keep your ticket because in some stations, you will need it to go out. Same concept as the London Tube, but the routes are determined by the name of both ends. For example, from La Tour Mabourg (Purple line) I want to go to Opéra, I will then take Line number 8 going to the direction of Créteil Pointe Du Lac (the right END of Line 8). On the fourth stop, I will go down to Opéra station and follow the Sortie sign which means the Exit. It’s really quite easy when you get the hang of it, you just need to know which side you’re going to. Also a warning, there are some gates that slam so hard when it closes so please be careful. This is like legit real when I say be careful. Even if you live somewhere where pickpocketing is quite normal and avoidable, don’t take this for granted. Pickpocketing and different kinds of modus-operandi are widespread in Paris. I personally have experienced an attempt when I was in the metro of Champs-Elysées. I was about to go through the gates when I heard my bagpack zipper open. I quickly glanced behind me and there was a couple dressed as tourists. I looked at him as he glanced away in embarrassment. He was using a brochure to hide his hand while he was opening my bag. They didn’t get on the train later on. Good thing nothing got taken and I heard it as soon as he opened it. There are also a lot more in the Eiffle Tower area. Sometimes people will approach you asking for donations for a charity. I experienced this and minutes later I saw her running with others when the police arrived. So basically, you really have to be mindful of your things in Paris and be alert. Since the number of tourists going in and out Paris are…. a lot, they have more guts to steal and they will do everything if you’re not observant. 7. Are people really rude? I don’t know about others but my experience in interacting with Parisian people was quite okay. There is this connotation that people in Paris are rude. I have never experienced that on my stay in Paris. Heck, I even experienced being kicked off a table by a Swedish woman in Norway, but more on that next time. I noticed though, that Parisian people are always busy. Maybe that’s why people say that they’re “unapproachable” but to be honest, it is quite understandable. Everyone needs to make a living and I have observed that Parisian people are hard-working people. They take their jobs seriously and they don’t mess around. Well, there may be a few rude or lazy people you can encounter, but every country has one. Sometimes, there are rude tourists too. So when you interact with french people, try to ask nicely and don’t be scared. Always greet with a “Bonjour” and say “Merci beaucoup” and you’ll be good to go. Crepes near the Eiffle Tower. Please buy from this man they have really good crepes and i’ve tried a lot. This one is still the best. Can’t say you’ve been to Paris without seeing the Eiffle Tower. Best time to go and take beautiful pictures is in the morning. Take some of your time to wake up early and go there about 7-9am and it will not be that crowded. Good thing our Airbnb is walking-distance away. You can get tickets to go up the tower. There’s a restaurant on the first level, Jules Verne by Alain Ducasse, but it may be quite expensive (Enderun represent!). There are also quaint cafes near the Eiffle tower so you can grab coffee and a croissant while fawning over the view. I find Notre Dame magnificent since one of my favorite disney movies is the “The Hunchback of Notre Dame”. You can buy tickets to go inside and go up to check the view and there are days when they have masses. The museum on its own is picture-worthy. I would love to chill outside and have a walk around where it’s less crowded. Once you get inside, be mindful of rowdy tourists. Minus the tourists, the inside is just as magnificent. When you get to the room with the Mona Lisa in it, you’ll be surprised and imagine that it was taken from an “expectations vs. reality” post. I managed to squeeze my way through the front and took a quick snap. Hey, just like concert moshpits ain’t it? Nothing could be more romantic than cruising on the Seine river with your loved one. It screams Paris so much. There are cruises at night too and I believe it would be much more prettier especially if you see the Eiffle tower sparkling at night. If you’re a fan of pretty parks and want picturesque areas for your photos, Jardin du Palais Royal is for you. It was quite a bit of a challenge looking for the entrance though haha. It’s walking distance from the Louvre Museum. There are benches here and it’s a quiet place where you can just chill and let your surroundings sink-in. When you go to Champs Elysées, no doubt you’d already see Arc de Triomph. Please be careful when taking your photos in the middle of the road with the Arc on the background. Please do it in respective spots and don’t just cross the road and pose. If you want to go up the Arc du Triomphe to get a view of Paris, that is also possible. If any of you have seen “The Devil Wears Prada” movie, you might be familiar with Place de la Concorde where Anne Hathaway throws her phone in the fountain as she quits her A-list life. Place de la Concorde is also a beautiful area with monuments and cute cafes. * Sacre Coeur- Gorgeous view up top and an alley of souvenir shops down below where you can bargain for a very cheap price. * Paris Catacombs- If you are a fan of adventure and eerie places, this might spark your interest. Not for the claustrophobic though. * Shopping at Champs-Elysées- A street filled with the world’s most popular brands. Be careful of pick pockets in this area. * Spend a day at Palace of Versailles- Spend a whole day here because it is in the outskirts of Paris. A very beautiful garden and palace. Check their site for the fountain show schedule. Other than art and the Eiffle tower, Paris takes pride in their food. Having to go in a culinary school with the practices of the Alain Ducasse Group, I was most ecstatic to try actual french food because i’ve been studying it for years now. If you can shell out a bit of money and time, try eating at a fine-dining restaurant. An example would be Jules Verne on the Eiffle tower. Make sure you make reservations when eating at these restaurants. When you’re a “cheap-asian” like me, there are affordable cafes around the area that still provide good food. Don’t forget to buy crepes. There are a lot of them in Paris but sadly there was only one that I really loved. Try the famous French Onion Soup and the Croque Madame. I also did not forget to try a Truffle Cream Pasta and Risotto in Paris, and I did not expect that I was truly missing a lot. They were generous with the truffles and the cheese and take their food to the next level. If you’re really lucky, you’d find these gems in the streets of Paris that serve good food. All in all, Paris was beautiful. The architecture, the art and most especially the food. All of this are based on my experiences. If you’re planning to go to Paris, do not be scared to talk to people. At the very least you tried. Be careful of pickpockets too. Enjoy your time in Paris! Au revoir!